Electromagnetic interference (EMI) and radio frequency interference (RFI) disrupts, interrupts, or degrades the electrical circuits used in military, medical, and industrial electronics. To optimize electronic designs and ensure electromagnetic compatibility (EMC), manufacturers incorporate EMI/RFI shielding. Traditionally, EMI and RFI shields were made of metal. Today, metal-filled silicone compounds are also used. Interstate Specialty Products die cuts elastomeric shielding materials that combine EMI/RFI protection with electrical conductivity, desirable silicone rubber properties, and cost-effective performance. For over 50 years, our Made in the USA manufacturing facility in Sutton, Massachusetts has provided precision die cutting services for a range of applications, including medical, scientific, electronics, and industrial. Today, Interstate Specialty Products can die cut EMI/RFI shielding silicones from compression molded sheetstock or continuous rolls. These electrically-conductive elastomers include silver-filled, nickel graphite-filled, and aluminum-filled silicones. 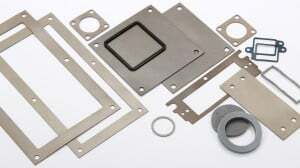 Shielding silicones are available in different hardnesses, and meet the MIL-DTL-83528 specification for EMI gasket materials. Particle-filled conductive silicones for thinner, smaller, and lighter weight applications are also available. For example, EMI/RFI silicones with an inner layer of conductive fabric enhance material strength and ensure electrical conductivity. Conductive silicones as thin as .009” are used in cell phones, computer monitors, and other electronic interfaces with slim, shielded screens. In addition to fabric-reinforced EMI/RFI shielding, Interstate Specialty Products can create shielding components from solid or sponge materials in virtually any shape or size. Depending on the shielding material, we can produce diameters from 0.250” to 60”, and in thicknesses starting at 0.003”. Choose military-spec and other certified materials, oriented wire products, or silicone with Monel. Interstate Specialty Products is ready to answer your questions about EMI/RFI shielding, and to recommend precision die cutting or digital die-less cutting for optimum value and minimum waste. To learn how our custom manufacturing capabilities can support your application, contact us on-line or call (800) 984-1811.